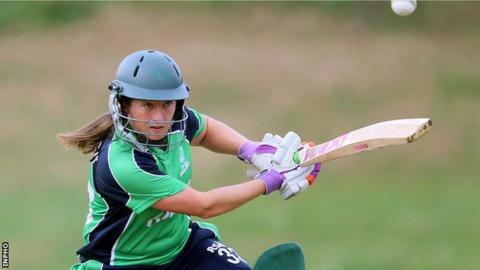 Isobel Joyce has stepped down as captain of the Ireland women's team following her side's exit at the group stages of the ICC World Twenty20. "It's been an honour and a privilege to captain my country for the last six years," said the 32-year-old Merrion all-rounder who made her debut in 1999. Joyce has won 132 caps across all formats, including one Test match, and has captained her country 62 times. She will continue to play for Ireland and could play in another World Cup. "I've played cricket for Ireland for over half of my life and while I have not decided when I will call time on my playing career, I feel it's time to step aside and help a younger leader to learn the role before I do eventually retire," said Joyce. "I'm looking forward to focusing on my own cricket for the twilight of my playing career and hopefully helping the team qualify for another 50-over World Cup, 16 years after I played in my first one." Highlights of the Joyce reign include leading her team in two successful qualifying tournaments to reach the finals of the last two World Twenty20s, winning the last one by beating Bangladesh in Bangkok in November. Ireland head coach Aaron Hamilton paid tribute to Joyce, thanking her for the dedication and professionalism she brought to the role. "Isobel has been a professional leader both on and off the field for the team," said Hamilton. "She will be missed in the role of skipper but I'm delighted she will continue to play and assist this group of talented young players, her experience will be invaluable for us going forward. Now we start the task of bringing on the next generation of leaders in women's cricket in Ireland." The decision as to who replaces Joyce as skipper will be taken in the coming weeks.